Or as low as $129.98 per month over 6 months. Apply Now. JL Audio built the JL Audio CP112-W0v3 enclosure to make car-rattling bass for a reasonable price, without the need for a ton of power. The enclosure’s designed to match the 12″ sub loaded into it, so you know you’ll get every ounce of performance out of this enclosure. The JL Audio CP112-W0v3 BassWedge contains one 12″ W0v3 subwoofer that handles up to 300 watts RMS, and is loaded into a specially built slot-ported enclosure. The enclosure can be placed with the woofer firing downwards, or in typical front or rear firing applications, giving you immense bass regardless of how you place it. JL Audio uses state-of-the-art automated woodworking equipment to fabricate the high-quality MDF enclosure with rugged automotive carpeting, nickel-plated push terminals, and solid internal wiring. 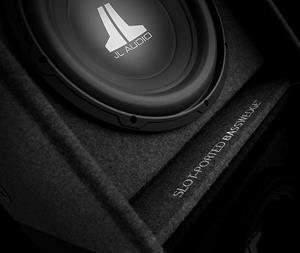 Overview: The JL Audio CP112-W0v3 slot-ported BassWedge subwoofer enclosure is designed around JL Audio’s 12″ W0v3-4 (4Ω) subwoofer. 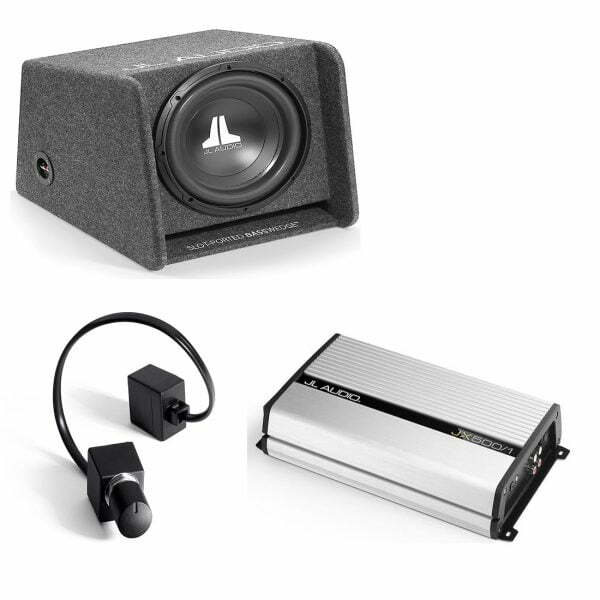 Aggressive tuning delivers powerful bass without the need for a huge amplifier. 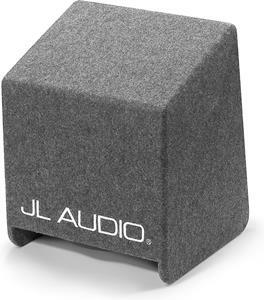 The MDF enclosure is covered with gray carpet and has JL AUDIO logos embroidered across the top and front. The enclosure design offers a variety of installation options: forward, rear or down firing. The slot-port runs along the bottom of the enclosure and fires on the same plane as the woofer; the port mouth is flared to minimize air-flow noises. Speaker Terminal: The enclosure uses one pair of nickel-plated, high current spring posts. The posts are located on the left side of the box and will accept pin connectors, single or dual banana plugs, or bare wire up to 10 gauge. Dynamic Motor Analysis (DMA): DMA is JL Audio’s proprietary method of improving dynamic motor behavior. 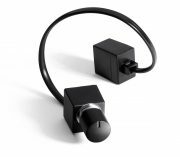 As a result of DMA optimization, the 12W0v3-4 motor displays linear force over a long excursion range, and also maintains a stable fixed magnetic field in the gap over a wide power range. The result is a reduced distortion, faithfully reproduced transients, and tight, clean, articulate bass. Elevated Frame Cooling: The elevated frame design of the 12W0v3-4 delivers cool air through slots directly above the top plate to the voice coil. This not only enhances power handling, but also sound quality by minimizing dynamic parameter shifts and power compression. Rear Gasket: The woofer has a rear gasket to provide an optimal seal when installing into the enclosure. Long Excursion: The subwoofer has an Xmax of 11.4mm, giving you louder bass with less distortion. Optional Grille: The optional SGRU-12 grille (sold separately) can be added to protect the woofer cone. Dimensions: The JL Audio CP112-W0v3 enclosure isn’t symmetrical; it’s approximately 16-1/2″ wide, 15-3/8″ tall at its tallest point (toward the front), 13-1/8″ tall at its shortest point (toward the back), 20-3/4″ deep at the base, and 16-5/8″ deep at the top. The JL Audio JX500/1D mono amp puts out up to 500 watts RMS to your sub, so you’ll experience thunderous bass in your music. Use the variable low-pass filter and bass boost to tune the amp to your subwoofer system. An optional remote level control lets you turn the sub up or down from the front seat. The amp includes speaker-level inputs, along with preamp inputs and outputs, so it’s ready to work in virtually any system. You know you’re holding a serious piece of sound equipment when you feel the heft of a JX amp. 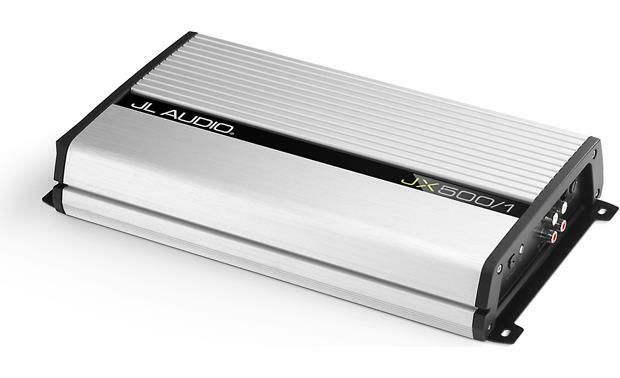 JL Audio designed these amplifiers with sturdy, high-grade parts that ensure excellent heat management, provide high current flow, and deliver stable performance in almost any situation. You won’t find blinking lights or meters on the outside of these amps, but you will find oversized output transistors and rugged MOSFET power supplies inside. The sleek, high-mass aluminum heat sink keeps things cool enough to virtually eliminate thermal shut-downs.